Download a map of our focus area as a JPEG image or Adobe PDF. 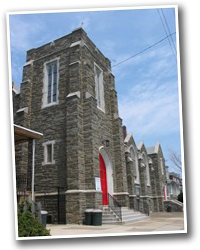 Wyoming Ave. Baptist Church is located at the very north end of North Philadelphia in a relatively small neighborhood called Feltonville. Always a lower-to-middle class neighorhood, Feltonville has seen waves of change as the city itself changes — from early large populations of ethnic Germans and Jews, to the current growth of the Puerto Rican community, Feltonville is in many ways a microcosm of the changing face of America. We recognize that the gospel not only does not respect ethnic boundaries — but that Christ compels us to work towards breaking down the walls that divide us. We are to live as One Body, working in our individual relationships and lives to mirror the love that Christ has for us. Below is a short (and technical) demographic summary that provides some background on our community as of the 2000 Census. 45% of all residents classified themselves as Hispanic. Of non-Hispanic residents, 23% are Black, 15% White, 10% are Asian. About 31% of all residents are school children age 3 – grade 12. Of those age 25 and over, only about half have graduated from high school. Over 25% of all families and nearly 33% of individuals live below the poverty level. Half of all families made less than $26,300 per year. Nearly half (45%) of residents classified themselves as “Hispanic.” Of the non-Hispanic residents, 23% are African American, 15% are White and 10% are Asian. 6% are two or more races. 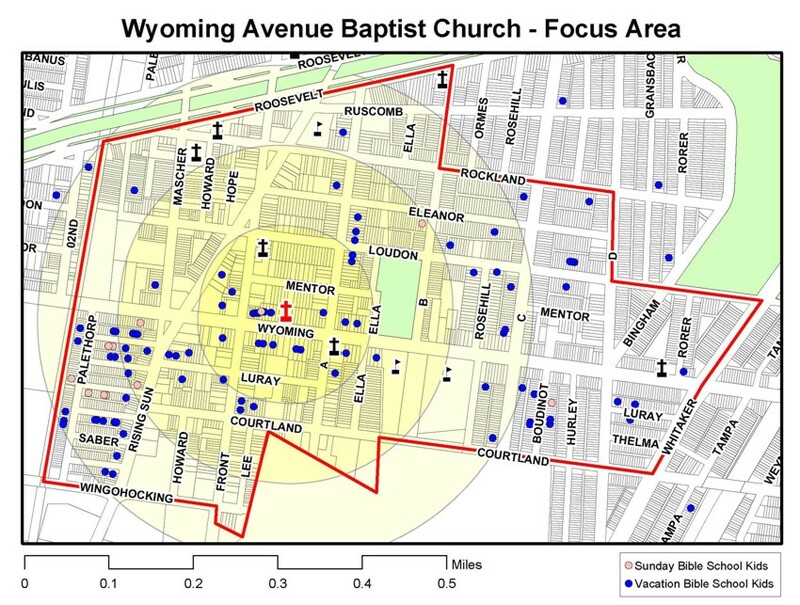 Our “focus area” (see map) contains a little over 8,600 people in total. Of the residents over 25 years of age, nearly half have not graduated from high school. Only 10% of the residents have achieved any post high school degree, such as an associate, bachelor’s or graduate or professional degree. The number of students in college or graduate school is fairly low, but children age 3 to grade 12 represent nearly a third of the total population of our neighborhood. Over a quarter of all families and nearly a third of all individuals in our area were below the poverty level in 1999. Half of all families in our area earned less than $26,300 per year. Only 15% of all families took in more than $50,000 per year. In the neighborhood surrounding the church, the two notably dominant languages are English and Spanish. Though census data indicate that English is slightly more prominent, the two are roughly equal in usage. A small minority of the residents of the neighborhood speak other Indo-European languages, while another minority speak languages from Asia or the Pacific Islands. The census data are further specified by recording the number of residents who speak English “less than very well.” Roughly 30% of the residents in our neighborhood fall into this category, of which residents, about two thirds are native Spanish speakers. These data suggest that the largest communication gap at present between our church and much of the surrounding community is the English–Spanish language barrier. About 20% of the people in our community speak Spanish primarily and English poorly.